Needless to say, a digital thermostat ensures reliable and efficient temperature control. Well, with so many different varieties of thermostats blitzing the industry, which one would best cater to your requirements? Let us have a look at the features, pros and cons of the best digital thermostats. This article is written as a guide to help buyers choose the best digital thermostat from those many options available in the market. We have reviewed the best 4 programmable digital thermostats from best selling manufacturers like Nest, Honeywell and Lux. The first 2 products (one from Nest and other from Honeywell) are digital thermostat with Wi Fi and remote control. Read the detailed review below to help yourself make the choice. The Learning Thermostat from Nest enables you to save a lot of energy by allowing you to program the settings as you wish when you are at home and simultaneously adding them to memory. Besides, it automatically powers itself down when you are away. The particular Nest model is much more streamlined and is about 20% slimmer than its previous design. Installation of this thermostat is very easy; you can install it within half an hour. This new model is compatible with majority of low voltage and cooling systems; the unique and new connector introduced with this model accepts four types of wires and is compatible with most heating and cooling systems. The new improved and enhanced software 3.0 fulfills almost all the needs of the consumers; it has several improved features besides the original Nest functions: System Match, True Radiant, Heat Pump Balance, Early-On, Filter Reminders, The Power of Nest Sense, Enhanced Auto-Away, Enhanced Auto-Schedule, Energy History, Airwave, The Nest Leaf, and Auto Tune. French and Spanish languages have been additionally included to the new Nest thermostat. The Nest mobile app is at present compatible will almost all Android tablets including Kindle Fire and Nexus 7. 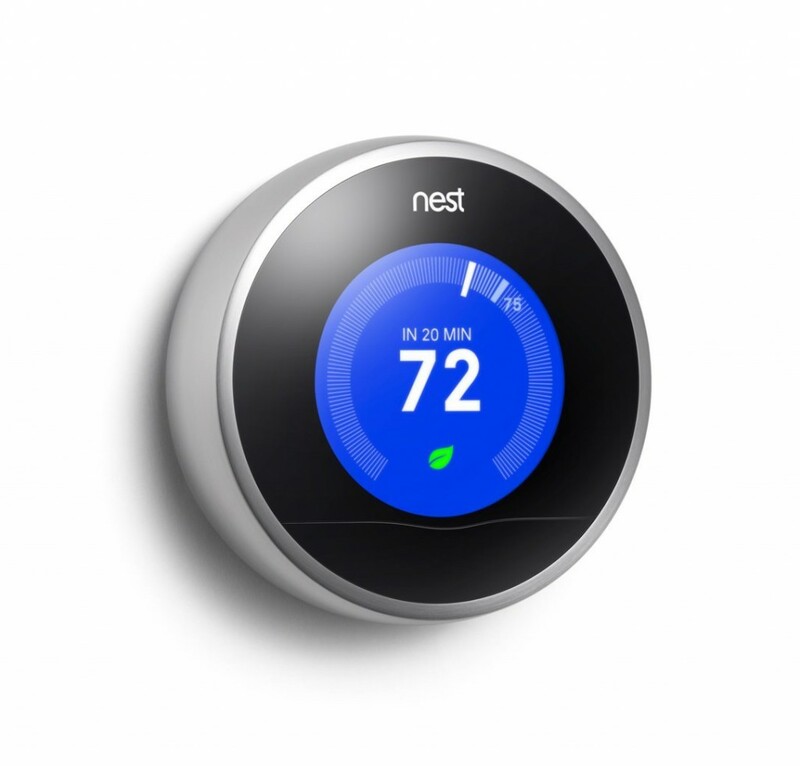 You can connect The Nest Learning Thermostat to Wi-Fi and control the device from your laptop, tablet or Smartphone. The device comes with a two year limited warranty. The thermostat is easy to install and set up; it has the ability to self-learn and add to memory your favorite settings. The sleek and trendy design is an advantage. The ability of wireless control over various devices from miles away is a big plus. In addition, it is a great energy saver. Information provided in the installation manual about the registration of the device to the main Nest website for wireless control and details on the actual wiring needed in your household so that the device function properly is insufficient. It is also said that tools mentioned on the Nest website for the analysis of the amount of energy used and saving incurred are also inadequate. The Honeywell Wi-Fi Smart Thermostat is extremely flexible allowing you to program your device either as a home or business thermostat and then offering scheduling features particular to your home or business. What are the main features of this Honeywell model? You can control the device from anywhere using Android and iOS devices. The setup is very simple with smart programmable features for both home and business. The thermostat comes with an easy-to-read customizable color touch screen; besides, you can choose a color scheme that matches well with your home’s décor or adds contrast effect. Smart Response temperature timing is a great feature. The thermostat learns the precise amount of time needed to reach your ideal temperature and acts depending on that; therefore, energy is not wasted as well as your comfort is not compromised. 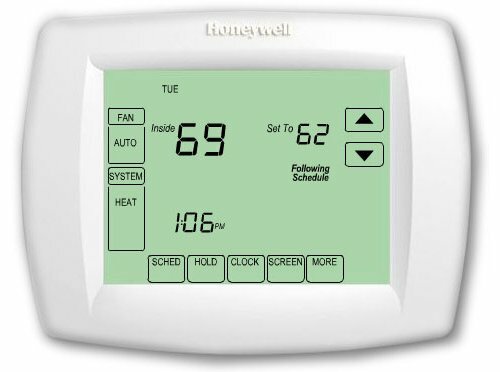 The device is compatible with all your current thermostats higher than 110 V.
Extreme temperature alerts and filter change reminders are immediately sent to the connected network devices as well as the display on the Honeywell Wi-Fi Smart Thermostat. The gadget has some advanced comfort and control features including Customizable Color Touchscreen, Locking Touchscreen, On-screen Comfort Information, Indoor Humidity Sensor, Advanced Fan/Control Comfort, Simple Programming, and Energy Savings. What about the disadvantages of the thermostat? Well, the price is a little high at $206.99. There is no battery backup. A lot of customers report of weak Wi-Fi reception. The device does not work with heat pumps and electric baseboard heat (120-140 volts). This premier universal programmable thermostat features automatic/manual changeover; with one quick reference to the user manual, you can start programming the device as the user interface is really intuitive and well laid out. In fact, you can program each day separately, multi-select days, review the programming without any editing and so on. What are the advantages of this Honeywell model? Seven-day programming enables you to program separately for each day. Change/Check Reminders allow you to know when to replace or service filters, batteries and the like. Multiple HOLD options help you to override the schedule of the program as you wish, with temporary and vacation hold settings. Circulation fan control feature runs the fan 35% of the time no matter the heating or cooling system in turned on or not. It seems like a feature that will help in keeping the temperature consistent in all the rooms. The price is much reasonable compared to other devices of the same level efficiency, $124.69. 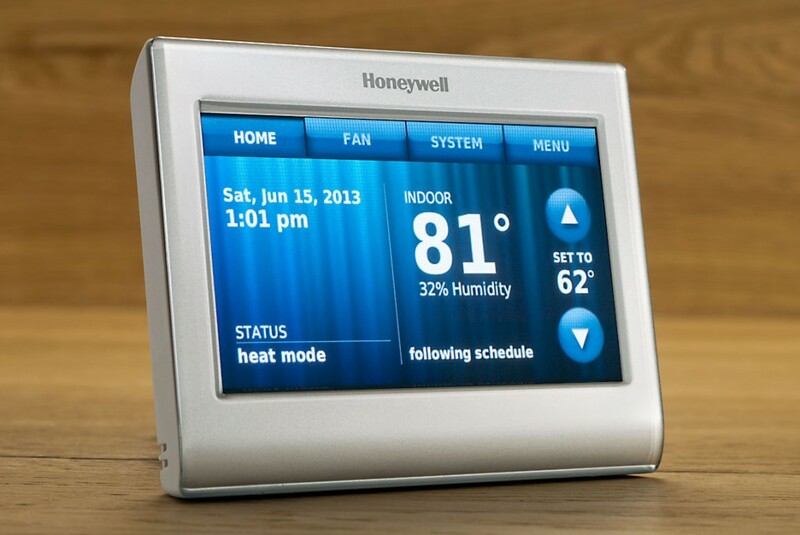 This model from Honeywell does not have humidity control feature that is found in its expensive counterparts; however, it is quite a necessary feature provided you live in humid places. The device makes an audible ‘pop’ noise when you switch the HVAC on or off. This Lux model is energy-efficient, easy to install as well as an economical option. What are the main features of the Lux seven-day programmable thermostat? It is a smart device that provides you with accurate and complete temperature control with the easy to use touch screen interface. 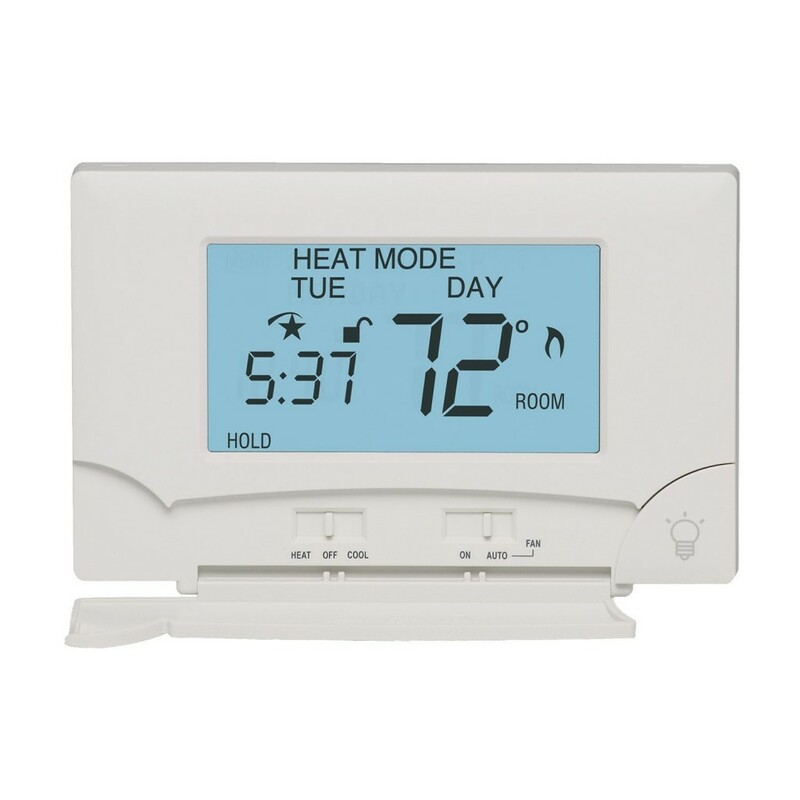 The thermostat has a range of user-friendly features like the do-it-yourself installation, responsive touch screen and a large lighted display that help you to simply program and operate it without any hassles. The large blue electroluminescent display is easy to read in all kinds of light settings. It displays the current day, temperature, time and the filter status. The audible touch confirmation lets you know that your options are being registered in the device. The flame and snowflake icons indicate the heating and cooling mode. The gadget is compatible with a lot of heating and cooling systems. This Lux thermostat allows you to program up to four different time and temperature settings in a day: morning, day, evening and night. Moreover, there is an option to set a different individual program for every week day. The thermostat is highly budget-friendly without any compromise made with energy efficiency. It saves about 33% of your home’s energy bills. It has a special keyboard lockout feature; it is a perfect option for houses that have little children. This superb model from Lux is a lot user-friendlier and easier to install. Furthermore, the settings and menus are intuitive and easy to understand. In general, this is a great product at a very reasonable price . If the programming terminology had been a little better, user experience would have improved. The tabs on the top of the base plate that hold the unit are very small and fragile so the user has to handle it delicately. Comparing the 4 products – Which one should you buy? Well, it’s pretty obvious that if you want higher end models with Wi-Fi connectivity and sleeky designs, you can choose Nest Learning Thermostat – 2nd Generation T200577 or Honeywell Wi-Fi Smart Thermostat. On the other hand, if you are running on a tight budget and still you need a great energy-efficient and easy to use thermostat, Lux TX9000TS seven-day programmable thermostat should be an ideal option. Honeywell TH8110U1003 Vision Pro 8000 Digital Thermostat is also a good choice as well provided you don’t live in a humid environment.